My archive image this week is neither sepia nor is it a photograph : but when have rules ever been important round here at Sepia Saturday? It's old and its interesting - who could ask for anything more. 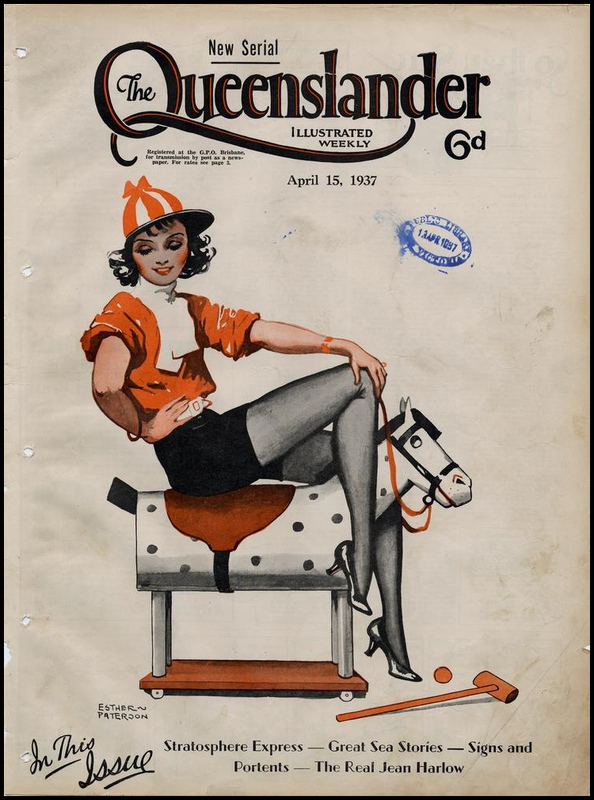 If the "themers" amongst us ask for anything more they can take their pick from pretty girls, horses, polo, Queensland, magazines, the stratosphere, sea stories and Jean Harlow. Not to mention the half dozen or so hidden themes that many of you like to discover and share with the rest of us. I have said before on many occasions, that I often think of blogging as being the natural descendant of these wonderful illustrated magazines of the 1930s and 1940s. So I look forward to Issue 94 of Sepia Saturday Illustrated Weekly which will be available at your local newsstand on or around Saturday 1st October 2011. To participate just link your post to the list below, and then "read all about it". SEPIA SATURDAY is a weekly meme which encourages bloggers to publish and share old images and photographs. All that is required is for contributors to post an old image (it doesn't have to be in sepia) and provide a few words in explanation. If you could provide a link back to the Sepia Saturday Blog and visit as many of the other contributors as you can, it would also be appreciated. There is no weekly theme, as such, but some people like to use the archive image published with the weekly call as a kind of theme. There is no requirement to adopt such an approach : the choice of image is entirely up to you. Once you have published your Sepia Saturday post, add a link to that post to the Linky List published each week and leave a comment to let everyone know you are joining in. You will be glad to see that there is not a train in sight for this weeks' theme photograph. 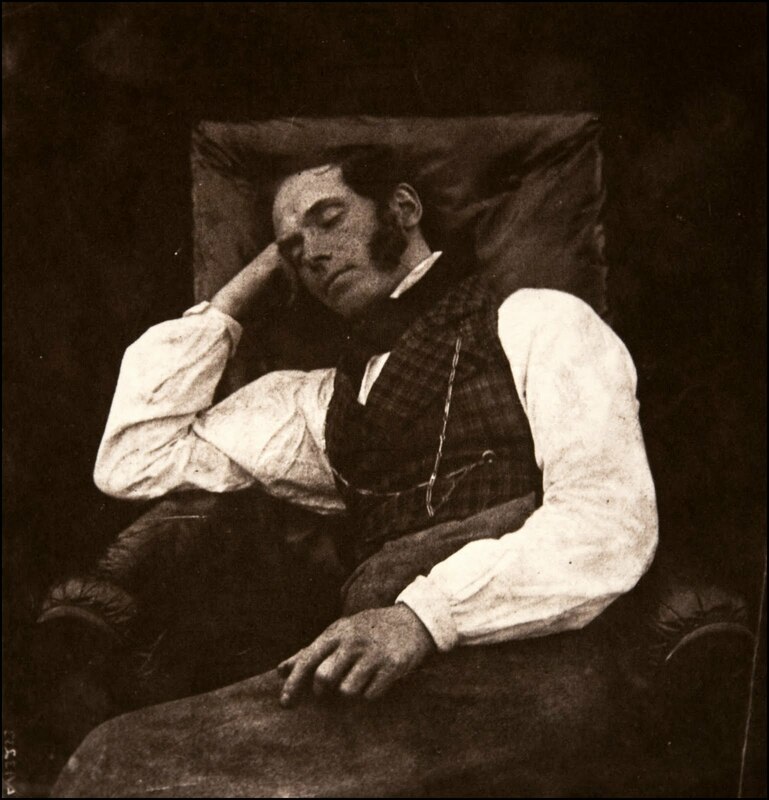 Instead we have one of the most famous images in photographic history - William Henry Fox Talbot's 1840s photograph of Nicolaas Henneman Asleep. It would appear that Henneman was Fox Talbot's Dutch valet and photographic assistant who later became a photographer in his own right. In those very early days of photography when subjects had to stay still for so long, a conveniently sleeping subject was perfect for a sharp print. As far as themes are concerned - make of it what you will : after 93 weeks I am well aware that you have the collective inventiveness to draw a theme out of the thinnest of air. All I ask is that you post your contribution on or around Saturday the 24th September 2011 and that you provide a link to it in the list below. That said, I am going back to sleep now. My theme picture this week comes from a new collection of archive photographs from the National Library of Ireland which can be found on Flickr Commons. Taken in September 1910, the photograph shows the offices of the London & North Western Railway Company on The Quay, Waterford, Ireland. 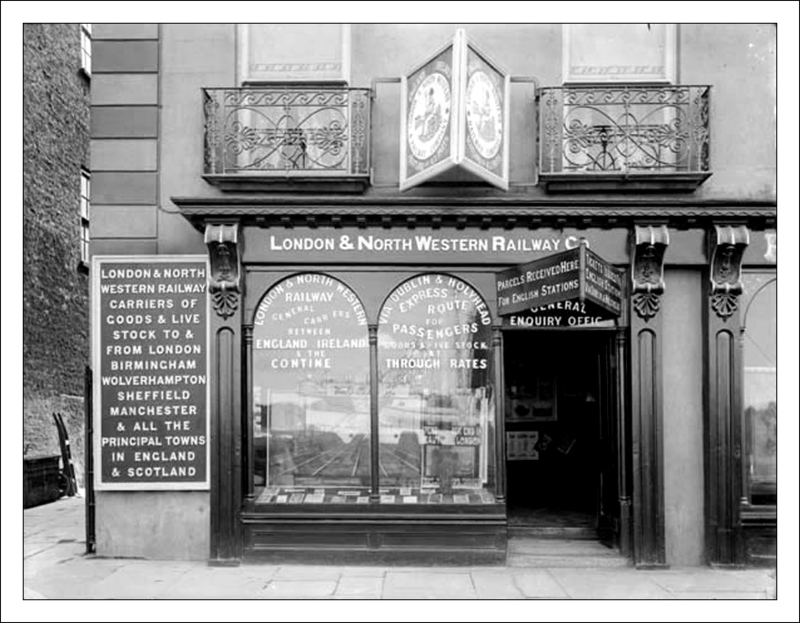 Back in the days when I would work for a living, I was a frequent passenger on that advertised railway route which linked "all the principal towns of England and Scotland" with Ireland via Holyhead and Dublin. Even though the old steamboat ferries had been replaced by high-speed catamarans, there was still a slightly sepia feeling about sailing across the Irish Sea. If you are looking for a theme for Sepia Saturday 92 (post your posts on or around Saturday the 17 September 2011) there is a suitcase full in the above image : travel, ships, railways, holidays, shops, Ireland or even hand-carts left leaning against a back street wall. But remember, you don't have to stay on theme (I don't, so why should you! ), just pack your digital suitcase with anything a little old and quirky and give us a treat. 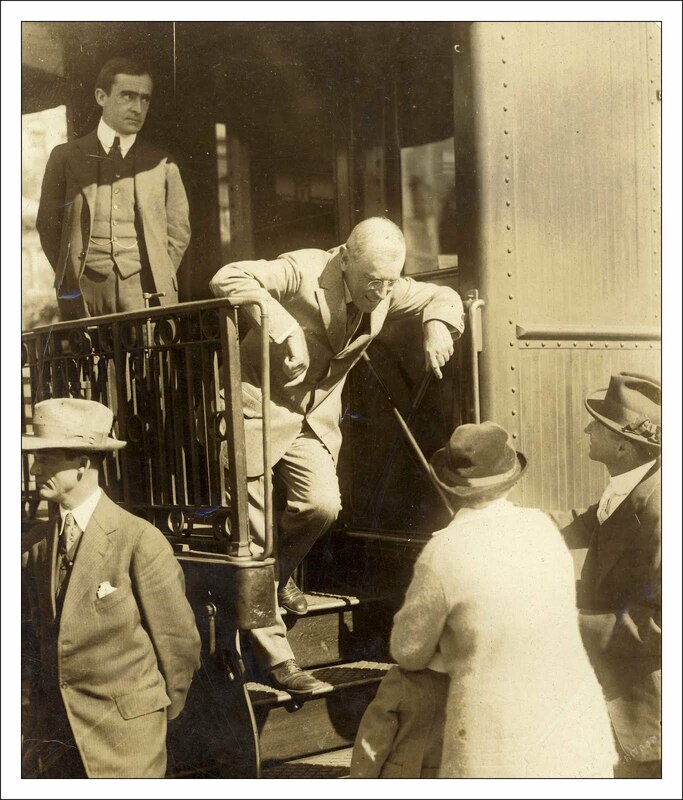 This photograph entitled "President Wilson on a Speaking Tour" dates from 1919 and is part of the on-line collection of the Woodrow Wilson Presidential Archives made available via Flickr Commons. As always it will provide a variety of potential prompts for all those in search of a theme for Sepia Saturday 91. But what I like most of all about it is the contrasting action taking place within the photograph itself. The secret service man at the bottom left stares out of shot, the man at the top left keeps a watchful eye on his President, whilst the President and the admiring couple of the right make up a delightful triangle on interaction. Sometimes a good photograph can provide almost as much action as a short film! Whatever kind of action (or inaction) you are featuring in your old images, let them speak out by posting them on or around Saturday 10th September and linking them to the list below.